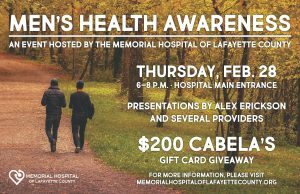 MHLC will be hosting Men’s Health Awareness on Thursday, February 28th from 6-8pm. There will be educational presentations, food, and giveaways. We encourage women to come to this event as well to learn about men’s health for the special man in their lives. Special Guest Alex Erickson will be speaking on why your health should be a priority. Dr. Dan Stormont, Orthopedic Surgeon, will discuss the mental/cognitive benefits of physical activity. He will address the pros and cons of your leisure and work activities, and realistic expectations of activities in the face of arthritis and other medical issues. Dr. Ian Stormont, Urologist, will be discussing issues unique to men, and some of the secondary issues spouses may encounter. From the little blue pill to the newest least intrusive solutions to the nighttime trips to the bathroom. Learn more about this exciting event. Our Mission Statement: To provide patient-centered quality health care to Lafayette County and the surrounding area.